Keeping coastal mangrove forests intact or replanting them is cheaper than building man-made structure to protect coastlines threatened by climate change, according to the head of the International Union for Conservation for Nature (IUCN). “Our message is, ‘Don’t assume that man-made or engineered solutions are the only ones to protect our coasts and rivers and to provide drinking water. We are not against engineering in the absence of natural solutions, but look at what nature has to offer,’” urged Julia Marton-Lefevre at the recent World Conservation Congress in South Korea. Preserving mangrove forests can help regulate rainfall patterns, reduce the risk of disasters from extreme weather and sea level rise, provide breeding grounds for fish and capture carbon dioxide in the atmosphere to slow climate change, she said. That suggests preserving them will be essential to fighting climate change and protecting lives and livelihoods in the face of climate shifts already underway. “Standing trees help us with inevitable climate change,” she said. “Keeping mangroves intact on the coast is not only good for capturing and storing carbon but also very useful for protecting the coast in times of extreme weather conditions and acting like nurseries for fish to ensure people have protein to eat,” she said. 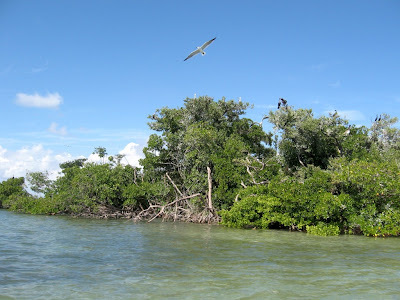 “Ecosystems, including mangroves, play a role in mitigation and adaptation. You have to respect the forests, wetlands, peatlands and oceans in capturing and storing carbon. Once you respect that, then maybe there would be an impetus to take care of (them) better,” she said, during an interview with AlertNet. “Standing forests also provide livelihoods for people,” she added. “You don’t have to cut the trees down to raise cattle. You could also grow food inside the forest canopy,” she said.